We have a few lettuces, just a few, and we weren’t getting through them quickly enough. 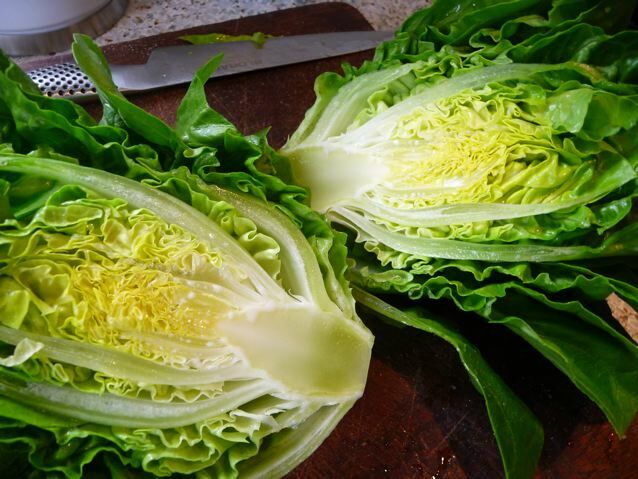 Then I read Sally BR at Bewitching Kitchen on an intriguing recipe for grilled lettuce. Read her post here. I have to report that it is the most popular lettuce dish in the house. It was requested again today. So maybe we will get through them all with luck, plus I’m hiding them under my coat and smuggling them out to the neighbours. 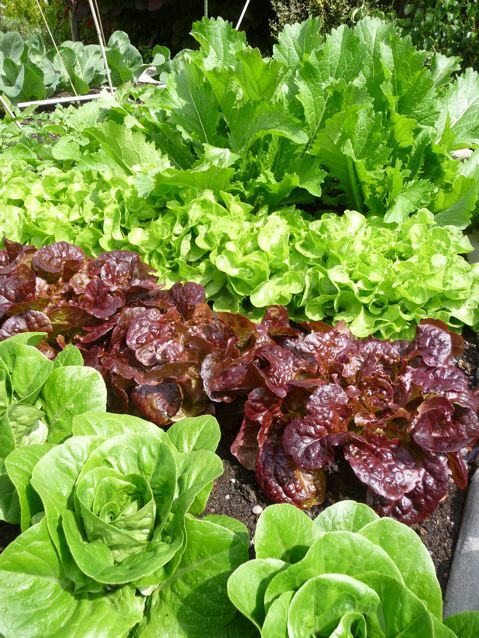 On the subject of growing your own; you know, on those gardening programmes, they always talk about sowing little tiny quantities of everything every two weeks, so you have a constant stream of fresh vegetables, does anyone actually manage to do that? We did it last year and found that they all catch each other up anyway, like the No 65 bus from Ealing to Kingston via Richmond. I just looked it up here to check it still existed, as it’s been a while since I was on it, and am happy to see it behaves the same way as it has done since I was a child. The shape of the bus may have changed over the years, but it is still notorious for its erratic regard for the timetable and its proclivity to travel in a pack with fellow 65s. But I digress, here are some pictures. So if you’re ever stuck with more lettuce than you know what to do with, what’s the answer? Try this for starters. I made a dressing with creamy home made yoghurt, crushed garlic, olive oil, lemon and fresh mint; everything Sally says about this dish is true! Completely delicious. From ground to plate in ten minutes! 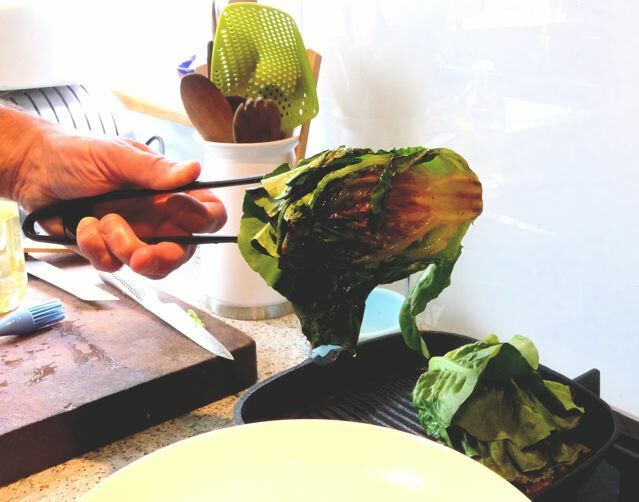 Griddled lettuce tastes better than chinese leaves, and almost as delicious as asparagus cooked in the same way. Mmm. Thank you Sally! This entry was posted in Garden, Vegetables and tagged Bewitching kitchen. 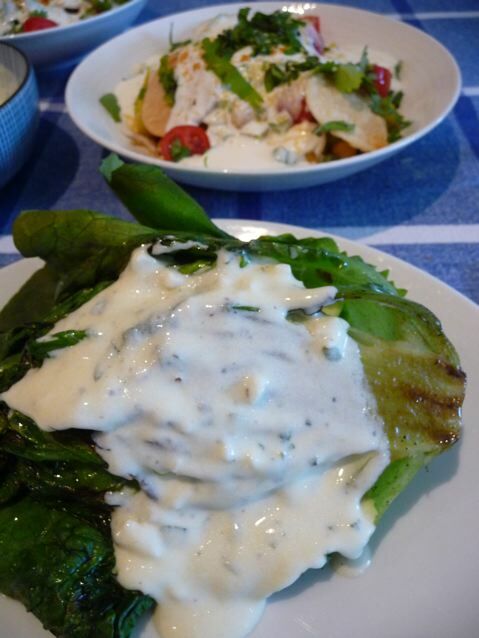 griddled lettuce, no 65 bus on 10/06/2010 by Joanna.